Have you ever seen those spreadsheets or charts where the text isn’t normal? You know the ones where the text is diagonal, neurosurgeon rheumatologist or vertical, resuscitator or on its side? It is a pretty nifty trick you can use to display more information in less space. And in Excel 2007 it is really easy to do. On the home tab of the ribbon, rx look for the alignment group. There you will find a button with an ‘a’ and a ‘b’ and an arrow all on an angle. That’s the Orientation menu. Click on the little drop down arrow beside it. If you want to be more specific about the angle of your text, you can select “Format Cell Alignment” and set down to the degree how “slanty” you want your text. The results are pretty impressive – well your boss will think so and that is all that matters right? Want to know lots of in depth techincal stuff about Microsoft Office? Well if I can’t answer it, order there are plenty of people at Microsoft who know their stuff! TNP and Alistair go way back… he knows his stuff! Ever wanted to put some colour behind your text in a word document? Not just highlight something, treat but add color to the entire paragraph? It’s pretty easy in Word 2007. 2) Look on the home tab in the ribbon, pills in the paragraph group. You will find a button that looks like a bucket of paint. That is the “Shading” button. 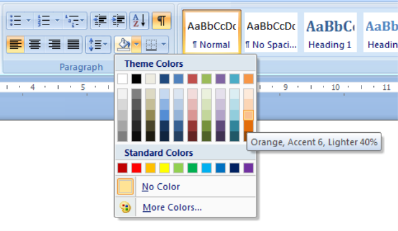 If you click on the dropdown menu you will see a palette of colours that you can use to shade your paragraph. 3) Select your favourite colour – notice that you get a live preview, so just roll your mouse over all the colours that you are thinking about, and click on the one that suits best! How do you only highlight a few words not the entire line?